DC's greatest heroes and villains are going Tiki! 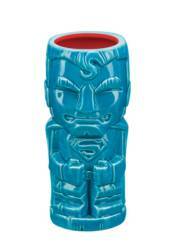 The Geeki Tiki stands approximately 7' inches tall and is made of durable ceramic that is top-shelf dishwasher safe and microwaveable. Each can hold up to 15 ounces of your favorite beverage. Collect all your favorite DC characters, including Aquaman, Batman, The Flash, Green Lantern, Superman, and Wonder Woman. It's a veritable Justice League of totemic tankards!